Located about 8hrs north of Manila via coach Batangas is quite far from Metro Manila to be able to go and come back in one day, however there are coaches coming and going to Baguio from Manila all the time from Pasay and Cubao. Baguio itself is quite beautiful and if you are into yoga and serenity then you will really enjoy this place and the pace of life here. If you stay here and want to go to something more tropical then you can always get the coach to La Union on the coast which will take you about 1.5-2hrs. Recently awarded by the Baguio Centennial Commission as one of the 10 oldest institutions in Baguio, Casa Vallejo Hotel has been brought back to life as a boutique hotel in the heart of Baguio City, Philippines’ summer capital. Located along Session Road, Casa Vallejo Hotel is a stone’s throw away from Burnham Park and SM Baguio. With 23 rooms, this charming property offers guests an experience that is intimate and discreet, and ensures exclusivity and privacy while providing the highest level of service. Also located here is the well-known Tapas bar and restaurant Hill Station, Mt. Cloud Bookshop, Lagalag Clothing and Outdoor Supply Store, and Cinematheque. One can truly have an authentic Baguio experience when staying at Casa Vallejo Hotel. Offering a terrace, Austrianne Residences provides accommodation in Baguio. Free WiFi is available. 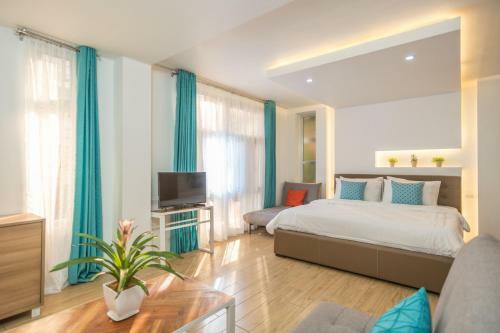 The units come with tiled floors and feature a fully equipped kitchenette with a microwave, a flat-screen TV, and a private bathroom with bidet. A fridge and kettle are also provided. Guests can also relax in the shared lounge area. Philippine Military Academy is 2.6 km from the homestay, while Camp John Hay is 3 km from the property.